•When opened will allow signals to pass through the hinge into the frame in an invisible manner. •Available in ball bearing type only. 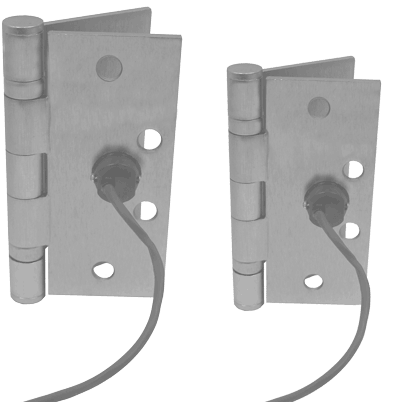 CONCEALED MONITOR: Miniature snap action switch is incorporated into frame leaf. Full mortise ball bearing, standard and heavy weight. Gauges available: .130, .134, .146. **NOTE: PURCHASE ORDERS PLACED FOR ELECTRIC MODIFICATION ARE NON CANCELLABLE** All electric hinge modifications are to be placed in the center hinge position, any other locations will void warranty. For grout fill frames, install PBB mortar box-Failure to install mortar box voids warranty. One hinge and 1 screw pack per unit carton. 1 screw pack includes all machine screws (8), and 1/2 wood screws (4). ATMS & AWS also available.